The parish of St. Rita’s has approximately 300 registered families, who make up an intimate, family-oriented, Roman Catholic community of people of all ages. Some have been here for many generations, while others are among the recently Baptized. All bring enrichment to our growing family of faith. If you are a Catholic and would like to join our community, please call 717.642.8815 or stop by the parish office to pick up a registration form. You many also download the registration form here, fill it out, and send it to us at the parish office. It would be our delight to include you among the roster of valued members who are helping us build Christ’s Kingdom here at Saint Rita’s. If you are interested in becoming Catholic you may need to explore the RCIA process. RCIA – Rite of Christian Initiation for Adults (and children 7 yrs and older) is a process for becoming a Catholic Christian. This process is primarily intended for those who are unbaptized. During this process adults and children participate in weekly catechesis and formation, and then in liturgical rites that both mark the progress of their journey with Christ and form them deeply by God’s grace. The culmination of this process is the celebration of the sacraments of Baptism, Confirmation and Eucharist at the Easter Vigil Service. This process takes place over a period of approximately nine – twelve months. While RCIA is intended for the unbaptized, the process and the liturgical rites provide adaptations for those adults and children (7yrs and older) who are baptized in another Christian denomination, and desire to make a profession of faith and come into full communion with the life of the Catholic Church. Much that is a part of the typical RCIA parish process is applicable and valuable for them. A shared catechesis and spiritual formation may be offered to those seeking full communion with the Catholic Church. 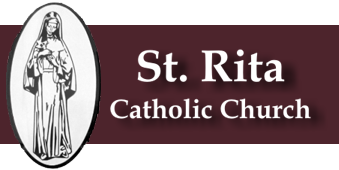 If you are feeling called to know more about the Catholic faith or wish to come into the Catholic Church please call the pastor of St. Rita’s Parish, Father Peter DiTomasso at 717-642-8815 or you can email him. The required RCIA and RCIC forms can be found below.